Upgrading a facility’s HVAC system is not a project to be entered into lightly. At best, such projects are costly and disruptive. Sometimes they fail to solve the issues that led to undertaking the project in the first place. Too often, replacement is the knee-jerk reaction to complaints from building occupants, or complaints from maintenance personnel, or high maintenance costs related to the existing system, or all of the above. If the replacement project is to be successful and actually solve the real issues with the system, it is imperative that facility managers understand what those issues are, what is causing them, and what can be done about them. One of the most effective ways to develop that understanding is by conducting a thorough evaluation of the existing system. 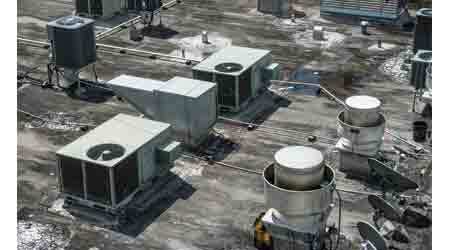 An HVAC evaluation is a component-by-component, system-by-system examination of all HVAC equipment serving a building. Its purpose is to identify what needs to be done to make things work properly. But the evaluation goes beyond just the equipment itself to include other factors. The evaluation must consider the operations taking place within the facility and how well the HVAC system supports them. It must factor in the size of the facility, the space available for the equipment, where the equipment is to be located, the climate, and the types of fuel available and their relative costs. All of those factors must be balanced against the needs of the operations being conducted in the facility and the comfort of the occupants. It does no good to have a high-quality, perfectly operating HVAC system if the system does not meet the needs of the operations and occupants. HVAC system evaluations are not the same thing as energy audits. Where the focus of the energy audit is concentrated on analyzing energy use within the facility or system, the HVAC system evaluation goes much further to examine the functionality of the system. Minimizing energy use is one of the goals of the evaluation, but not the only one. Evaluations also aim to optimize system performance in terms of the needs of the occupants and their operations. Most HVAC upgrades are designed to improve system reliability while minimizing energy use. An HVAC evaluation will identify what is not functioning properly in the current system, what repairs are needed, and if restoration or replacement is the best option. When necessary repairs are identified, the evaluation will quantify the costs of those repairs as well as the resulting savings in energy and maintenance costs. The analysis goes beyond costs and savings. HVAC systems are designed to perform specific support functions. Implementing corrective actions identified by the evaluation will ensure that the system is meeting those needs as fully as possible. In some cases, the evaluation will identify the need to perform costly repairs or upgrades to the HVAC system. In others, it may show that the best course of action is a total replacement of the system. In both cases, facility managers will have to obtain funding for the work. The evaluation provides them with hard data as to why the expenditures are justified and the potential consequences if upgrades or replacements are deferred. Another important aspect of the evaluation is that it can determine if the system is in compliance with all applicable environmental and energy regulations. Regulations and standards are constantly changing and growing stricter. If the HVAC system is more than 10 years old, chances are it no longer meets all the requirements. The evaluation will identify those areas and indicate what can be done to bring the system into compliance. HVAC system evaluations are particularly beneficial when facilities are being purchased. A cursory visual inspection of the system shows little more than the fact the system is operating. It reveals nothing about the condition of the system, how well it will meet the needs of occupants, and what repairs will be needed immediately and in the near future. A complete system evaluation is the best way to perform due diligence.